A testament to masterful blacksmithing, this steel blade brings handsome, hand forged style to your prep. A testament to masterful blacksmithing, this steel blade brings handsome, hand forged style to your prep work. Using time-honored techniques, artist Steven Bronstein hammers recycled steel to produce an eye-catching chopper that harkens back to the bygone days of craftsmanship. Handmade in Vermont. Working out of an old dairy barn in Marshfield, Vermont, blacksmith Steven Bronstein has been creating functional and sculptural ironwork with his team for over 30 years. At the forge you will see both the traditional and contemporary tools available to the modern blacksmith. His designs strive to blend the primitive charm of ironwork with the energy and interest of more contemporary design. Relying on the qualities that make iron such a beautiful material, Steven's pieces are both delicate and rugged. Steven celebrates this aspect of his art and looks forward to all of its possibilities. To preserve the finish, please hand wash and dry. Occasionally apply mineral oil or any other food safe oil. Use an abrasive pad to remove any oxide and then recoat with oil. Help condition and preserve your chopper with mineral oil. Looks great bit since its a gift I'm not sure about how it works. However, I thinknthe finger holes could be a bit larger. My brother wasn't impressed with my artsy gift. He made fun of it like it was some kind of killing tool. Yes, I was upset at his response, as I thought he would have appreciated it as a tool and the cool unique design. This was purchased as a gift for someone else but I plan to get one for myself. Nice and heavy. This is going to last forever. Very happy with purchase and exactly as pictured. Our kids celebrated their 11th anniversary and the gift of choice was something steel. so this cute herb cutter was the best ever, cause they grow their own basal and other herbs. they love it!! Such a unique product, great for all your herbs. This was a gift for someone who already owns two of his clocks. I was thrilled to find this chopper on Uncommon Goods. She loves it. 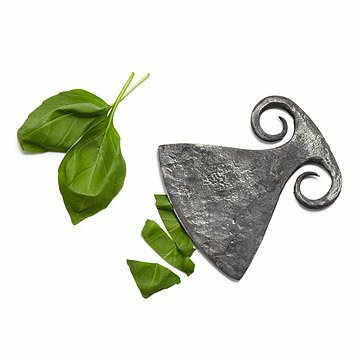 This herb chopper is a beautiful piece of artwork. I use it jokingly to cut a PB&J, it glided easily through the bread. The handle is comfortable to use. Overall an excellent product.